A perfect gift for young children age 0-8, boys and girls (Birthday's; Christenings; Christmas; Easter, New Borns or simply 'because'). Our special handmade books make your child the star in their very own personalised story. Every personalised book is created especially for your child’s name so a S-O-P-H-I-E would have a different book to an A-L-I-C-E.
With clever rhyming verses, full page colour illustrations PLUS you get to pick the Adventurer that most resembles your child. Your child helps a host of fun and colourful characters who, in return, gift letter rewards along the way. 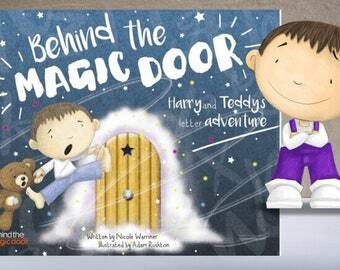 At the grand finale – your child places their letters on the 'magic door' to find that they spell out their name (big smiles here as they realise the whole book is ALL about them!). An ideal gift for children from 0-8 that is proving really popular for Christenings, Baby Showers, Birthdays, Weddings and Christmas. The character stories are full of positive affirmations helping children to learn about positive traits like honesty, kindness etc. Packed in a book that is all about them to make it engaging and to help them to learn to read. We are a small family run business and very much look forwards to creating a 'magical' personalised gift for you. We have a very personal customer service so please don’t hesitate to get in touch (we love questions!). Thank you so much for taking an interest in our unique books. 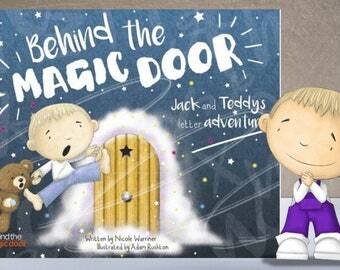 Gift Wrap (best wishes) for Behind the Magic Door, Personalised Childrens Book, Make it perfect! Great quality of books. Had an issue with one of my books and emailed the creator & they started on the correct one right away for me! Absolutely love this customized book and can't wait to share it with our granddaughter! It arrived really fast from the UK all the way to Hawaii aqnd it was customized just as requested. Can't recommend this book enough; it makes such a lovely gift and keepsake! I ordered this beautiful customized storybook for my niece and goddaughter Nora. I am so excited to give it to her this Christmas. I know she is going to love and cherish it forever. Thank you for your creativity and thoughtfulness. We accept pretty much all methods of payment (excl camels, bitcoins and gold bars [though we could make an exception for the gold bars]). Orders are are processed the day they are received (to 10PM) so that we can get them to you as quickly as possible. We always aim to get your book to you as fast as possible with the norm being towards the smaller number of days in the range - but most importantly we wouldn't want to disappoint young children so please allow a couple of days contingency if it is for a special event. Our reputation is everything and we genuinely work really hard to make sure that our books and service are the very best that they can be. We rely heavily on positive feedback and recommendations so if you love the book, please tell your friends - if you don't, please tell us. How do I know what my book will look like? Please don't just take our word for it. 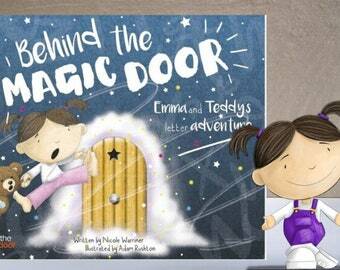 You can create a full book preview in about 10 seconds on our web site at: https://behindthemagicdoor.com just copy the URL into your browser or search for "Behind the Magic Door". A very easy 'try before you buy'! How are the books personalised? 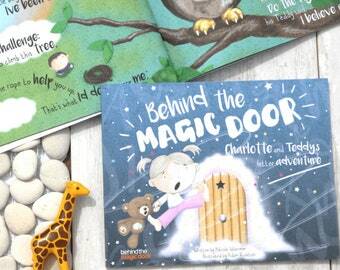 Our books offer enhanced personalisation like no other! 4. Each character that your child meets rewards them with a coin with a letter on eg the Lion gifts the letter 'L', the Elephant an 'E' etc to spell out your child's name. This means that each book is unique to your child. 5. 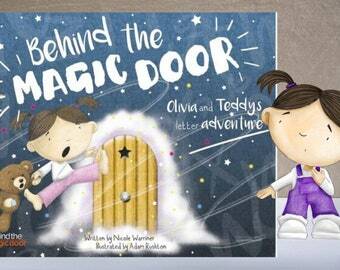 The magical finale - your Child's name appears on the Magic Door for the big reveal to 'open' the door and return home. Want to enter a competition for a free book? 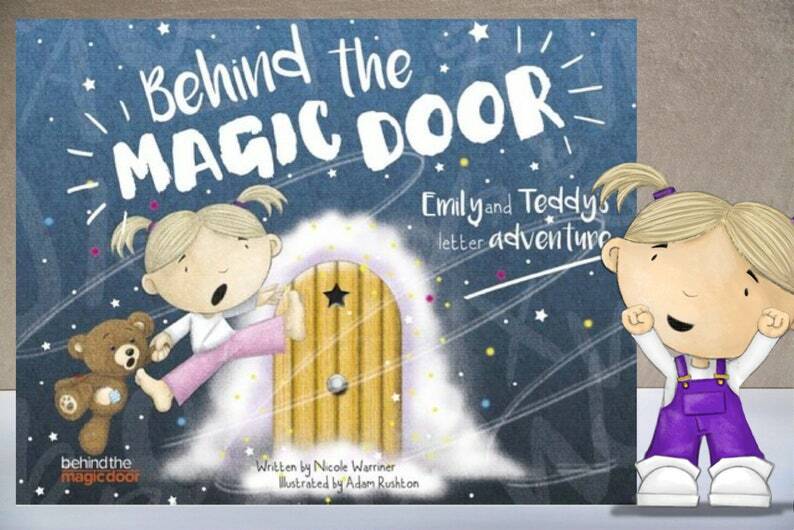 We run regular competitions via our Facebook page https://www.facebook.com/BehindTheMagicDoor/ please feel free to Like our page and check out our latest competition. Absolutely. We have created our very own "Behind the Magic Door" gift wrap with all of our favourite characters on. Ideal for when your gift is going straight to the recipient to make it extra special. To get your book gift wrapped simply add the gift wrap option from our shop for only £2.99 and we will make sure that it is professionally wrapped ready for dispatch. Is this book suitable for babies and very young children? The book that keeps giving... from birth to about age 8. Do you include the receipt or pricing information with the book? No - we recognise that our books are nearly always bought as gifts and often sent directly to the recipient so we never include a receipt or pricing details in the packaging. All you need by way of pricing details for your records, is kept electronically by Etsy. What are your Christmas 2018 Shipping Dates? We always recommend allowing a few days contingency when able. We always process orders same day but cannot "guarantee" Christmas delivery as some items get caught in your countries customs for checking, which can prolong shipping times. We've shipped to 46 countries so far so if you live in another location - just drop us a line if you'd like to check our delivery times. We always get back to you very quickly so you know where you are up to. Personalized book, Ideal gift for: newborn, kids, boys, children, boys, girls, birthday, christmas, christening, baptism, Baby. Gift book.